I must confess, while I am a fan of NickJr’s no-commercial, preschool cable channel, one of their programs I’m less than fond of is Yo Gabba Gabba. So when I was presented the opportunity to take my 3 year old girl to their live concert event, I’d be lying to say I was completely thrilled. It turns out, though, I thoroughly enjoyed the experience! My head did not explode nor my brains turn to jelly. Here’s a simple survival tip for other dads out there presented with a similar opportunity: Remember, this isn’t about the show… it’s about a shared experience with your child. What I found was, I watched almost none of the show. Instead I focused upon my daughter and her reaction to the experience. In all things, whether it’s the wonders of nature or a man-made spectacle of this sort, there is nothing like seeing the world through the joy filled eyes of a child. What have you and your kids shared? 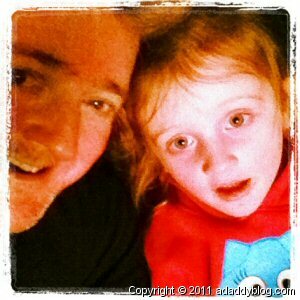 What a lucky girl she is to have a daddy that wants to go with her to things, and spends so much quality time with her. I cannot begin to imagine how much that will effect her as she grows up, surely though it will impact her in such a wonderful way! Thank you so much, Shannon. I’m definitely a work in process as a dad. She certainly, though, could not be more loved by her parents. 🙂 I’m the luckiest guy in the world to have such a wonderful wife and daughter. We took our daughter to YGG live last year and it was pretty amazing (her reaction not the show). But I will admit I did enjoy the show, I was singing along. Come on who doesn’t like the song “Eat”. Right? Watching our kids reactions is the best part! The show did do a good job, and it was mercifully short (in deference to the wee ones in the audience). Thanks so much for dropping by, Niel! What wise advice you have given here. I really loved the video though; her reaction to the falling snow is awesome. Such priceless moments and memories are being shared! My wife has taken our daughters to the Yo Gabba Gabba tour twice, the first tour a couple years back, and this latest tour. It’s a great memory for all three of them. The littlest one was just a year old, so she probably has a hazy memory of the first time. But now that she’s three and got to see her favorite character, Brobee, in person, again, she’s still so happy. p.s. On an unrelated note, I’ve just started working with a personal fitness trainer, and have subscribed to your RSS. Thanks for stopping by. My oldest (6 y.o.) is the foofa fan. She’s all about pink as well. Very much the princess. But since she’s learned blue is my wife and I’s favorite color, she now have two favorite colors. Best of wishes on your fitness aspirations for the coming year, and thanks for adding my RSS. AWWW you were very sweet to take her for HER. My kids are grown and I miss doing everything with them. Luckily they gave me grand-kids who love to go everywhere with me. Love the video, your daughter is precious. It must have been truly wonderful to see the show through her eyes. It really was, Deidre. Thank you. I am actually a fan of YoGabbaGabba. I guess you can say it grew on me since all my kids watch it. I actually ended up buying my 3 year old daughter a small foofa doll (the pink one) today. However, your article was really touching and you are absolutely correct about the quality time spent with your daughter and what that experience means for the both of you. I myself missed the chance to go see this show with my daughter Live when it was here in my area, but Im sure Ill get the chance soon enough and share my experience as well. Great articles, keep up the great work. Thanks, Michael. My daughter wore a Toodee hoodie to the concert, but her favorite is Foofa, too. 😉 The things we never thought we’d know a few years ago. Definitely try to take her if it comes back to town. As I said, I watched almost none of the show, but had such fun with the shared experience, and watching the joy in my little girl’s eyes. I definitely will. I watch her and her baby sister sit through the show on television, I can only imagine the excitement and joy they would have seeing it Live. Thanks for sharing your experience with all of us. Around the same time you were taking your 3 year old girl to see Yo Gabba Gabba, I was taking my 2 year old girl, along with my wife, to see Barney Live! I couldn’t stand Barney before my daughter started watching him. As months past, I realized there are a lot worse things for her to watch and after all, it makes her happy. So when I found out Barney was coming to a venue near me, on my birthday no less, I tipped my cap to the man upstairs for his sense of humor and bought the tickets right away. Being able to see my little girl as happy as can be was the best birthday gift of all! I am not a fan of YoGabbaGabba but my three year old daughter is. I guess I will see the for a long time. The show is a great bonding for every family .Continue a great job. Thanks, Mark. We had a great time! I think, your observation is perfect, and I’m with you. Also i think that, your daughter is very smart. I’m pretty sure she’s smarter than I am, Jose. Thanks for dropping by. 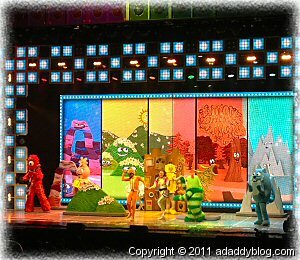 You know… as much as I enjoyed seeing our little girls joy at this Yo Gabba Gabba Live concert, I’m not that sad that she’s grown past them. Hopefully it will be a while before the Biebs or someone equally awful catches her eye? Yikes!